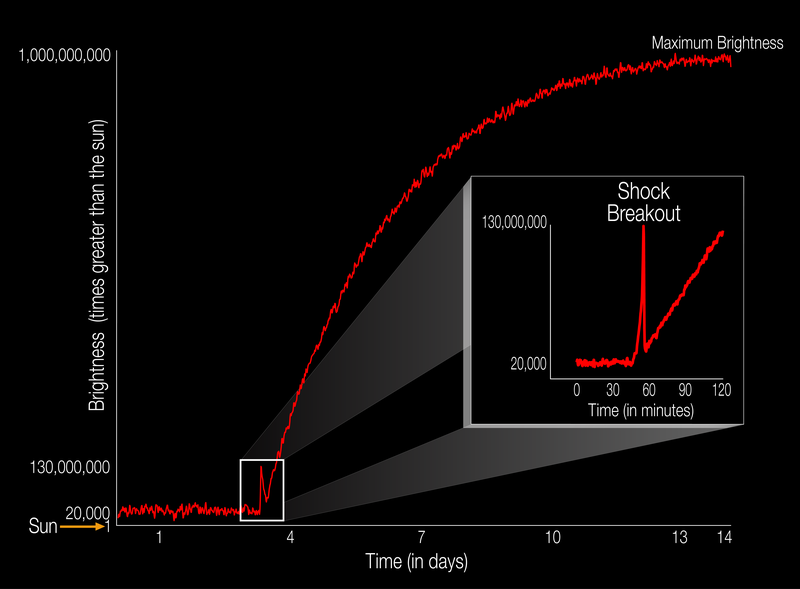 NASA's planet hunter, the Kepler space telescope, has captured the brilliant flash of an exploding star’s shock wave—what astronomers call the “shock breakout” of a supernova—for the first time in visible light wavelengths. In 2011, two massive stars, called red supergiants, exploded while in Kepler’s view. The first behemoth, KSN 2011a, is nearly 300 times the size of our sun and 700 million light years from Earth. The second, KSN 2011d, is roughly 500 times the size of our sun and about 1.2 billion light years away. “To put their size into perspective, Earth's orbit about our sun would fit comfortably within these colossal stars,” said Peter Garnavich, an astrophysics professor at the University of Notre Dame in Indiana who led the analysis efforts. But the supernovae also revealed an unexpected variety in these cataclysmic stellar events. While both explosions delivered a similar energetic punch, no shock breakout was seen in the smaller of the two supergiants. Scientists think this is likely due to the smaller star being surrounded by gas—perhaps enough to mask the shock wave when it reached the star's surface. Garnavich, Shaya and their co-authors are part of a research team known as the Kepler Extragalactic Survey (KEGS). The team is nearly finished mining data from Kepler’s primary mission, which ended in 2013. However, with the reboot of the Kepler spacecraft as NASA's K2 mission, the team is now hunting for supernova events in other distant galaxies. 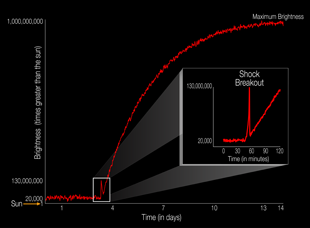 The research paper, “Shock Breakout and Early Light Curves of Type II-P Supernovae Observed with Kepler,” has been accepted for publication in the Astrophysical Journal.